Battery drain is a problem common to all smartphone users. Power Bank is supposedly the easiest solution for this problem. 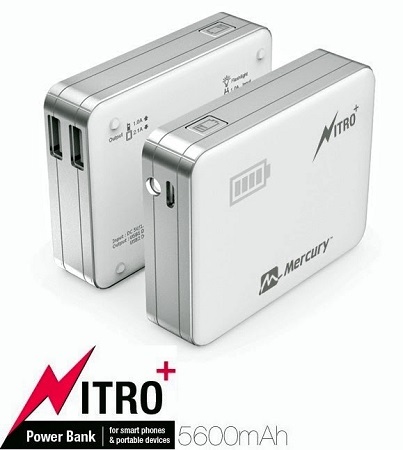 With that in mind, Mercury has launched the Nitro Plus Power banks. Kobian has announced the launch of the Nitro Plus power bank range which includes Nitroplus 5600, Nitroplus 6000 and Nitroplus 13600. The power banks come with 5600 mAh, 6600 mAh and 13600 mAh battery capacities respectively. The banks have a DC 5V/1.0A output potential with input potential at DC 5V/2.1A. The Nitro Plus power bank range have dual USB ports which can be used to charge two devices simultaneously. The five intelligent LED lights display the battery status as well as prompt the need for recharging. The Nitroplus 5600 is priced at Rs. 1099, the Nitroplus 6000 at Rs. 1199 and the Nitroplus 13600 at Rs. 1599.